The Department of Sociology, Christ University in collaboration with Institute for Social and Economic Change (ISEC), Bangalore organized a two day national seminar on 12 and 13 March 2014, on the theme ‘Poverty and social exclusion in India: Need for paradigm shift towards an inclusive society’. It was funded by Indian Council of Social Science Research (ICSSR), New Delhi. The seminar aimed at enabling dialogues on the conceptualization of poverty and social exclusion in India. It was attended by several academicians, faculty and research scholars, policy planners, officials, representatives of civil society, NGOs, media, social and development practitioners from Bangalore and all across India. Various aspects of poverty and social exclusion, especially the multidimensionality with respect to its intersection with social, economic and political exclusion were presented and discussed in this seminar. We hope that the deliberations and discussions have given the participants an opportunity to reflect on the theory and practice of poverty and social exclusion to build an inclusive society. In his key note address, Dr. Binay Kumar Pattnaik, Director, Institute for Social and Economic Change (ISEC) set the tone for the seminar by introducing the concepts of poverty and social exclusion. He started with various theories of poverty and how it has been understood and debated by various scholars in different parts of the world. He elaborated on the four theories of poverty starting from the theory of Oscar Lewis to Anthony Giddens. He strongly disagreed with the idea of social exclusion given by Giddens. He also explained the changing definitions of poverty from just economic dimension to that of a standard social living. Thus, he could contextualize the theme of the seminar and its relevance in the Indian context. The proceedings of the seminar as well as a research series were released by the dignitaries during the inaugural session. The seminar had four sessions per day. Each session was defined with a specific conceptual framework. 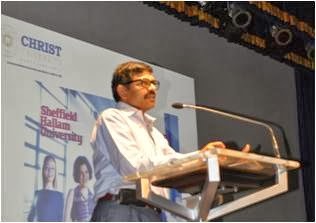 Dr. Anil J Pinto, Registrar, Christ University, in his valedictory address stressed the role of higher education institutions like Christ University in bridging theory and practice. The two day intellectual exercise ended by leaving lot of inputs for the academic fraternity to reflect on and to work upon. Millions of people are affected by HIV (Human Immunodeficiency Virus) every year and millions die as a result of it. But the worst part of this disease the social stigma and aversion they face from the society. The isolation and discrimination they face from the society is the hardest part of being a HIV-AIDS patient. The quote which is stated above served as an inspiration for the students of Class 1BCOM ‘B’ who spend a day of their lives at an AIDS care home centre. The main purpose of the visit was to interact with a few HIV patients of all age group and bring happiness for them and most importantly a smile on their faces. 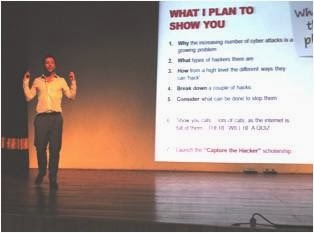 As a part of the South Asia Hacking Tour - Delhi Hack 2014, a team from Sheffield Hallam University headed by Mr. Neil Richardson delivered a technical talk on ethical hacking on 5th March 2014 at Christ University Faculty of Engineering, Kengeri. The event comprised of three elements- a talk, a workshop and launch of competition. The speaker Neil Richardson is a senior lecturer in the faculty of Arts, Computing, Engineering and Sciences at Sheffield Hallam University. He has a specialist interest in ethical hacking and mobile security as well as web-app security, firewalls and Linux System Security. He was accompanied by Mr. Stephen Lofthouse who is a senior lecturer within the Faculty of ACES at Sheffield Hallam University and works within the field of business computing. He teaches web programming, business process modelling and enterprise computing (specifically SAP technologies.). The team also included Ms. Anita Sandham, international marketing manager for India and Ms. Sudha Toppo, Regional Coordinator at South Asia Office, Sheffield Hallam University. 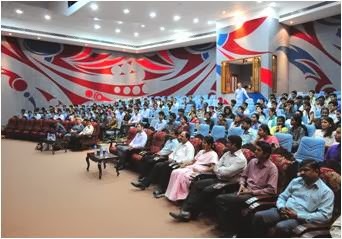 The talk saw participation of over 120 students and faculty members from Department of Computer Science and Engineering & Department of Information Technology. Following the talk, a hands-on workshop was conducted by Mr. Neil Richardson and Mr. Stephen Lofthouse, which was attended by 20 students from the pre-final and final year B.Tech. The workshop was mainly focused on how to use different tools to help in network scanning and identification of vulnerabilities across systems in the network. It was well appreciated by the students and faculty members alike. Systems to study at Sheffield Hallam University – September 2014 intake. CANTATA 2014 was held on 18th February 2014 at Christ University Kengeri Campus, conducted the by students of Christ University Institute of Management. CANTATA is a Sporting Extravaganza and a family day for CUIM, Where member CUIM got together to showcase their skills in sports and entertainment. It was also the perfect opportunity for every member of CUIM to bond and celebrate together.All the Christites of CUIM participated with the utmost spirit of sportsmanship and camaraderie. CANTATA 2014 was a mix of Sporting events (Track and Field), Fun activities and cultural revelry. The day started with the Sports events at 9.00 AM which went on till 12 45. The event included many track and field events both for students and faculty.In the post lunch session, each section in well defined clusters headed to the various FUN ZONES in the campus. FUNZONES hosted some wonderful fun activities like tug-of-war, blind navigation, quizzes etc,. The fun activities lasted till 4.20 PM. In the evening all of us assembled in the Open Auditorium for the cultural and valedictory program,where students were recognized for their achievements in sports, cultural competitions and management fests of different business schools. Director of CUIM Fr. Thomas TV, Campus Coordinator Dr. Jeevananda graced the occasion and gave some inspring thoughts about the day. The Auditorium then gave way to the DJ evening, followed by dinner at 7 20 PM. “I was given the responsibility of being a Fun zone co-ordinator. True to its name, the event comprised five zones namely Salka, Tug of War, Blind navigation, Brain Scrum and Crazy hurdles which ensured that the CUIM family had a wonderful time and a lot of fun. The three hour session which happened during the afternoon was managed within the stipulated time. I had to ensure that the zones stuck to the time without compromising on the planned rounds in each of the zones. The participants were given chocolates for winning for "FUN". QUEST CLUB, the quiz club of CHRIST UNIVERSITY INSTITUTE OF MANAGEMENT (CUIM) conducted its annual inter-campus business quiz event INTERROGAR 2014 on 25th February 2014. Great team work of Quest crew and, support and guidance from the Director of CUIM, Fr. Thomas TV made INTERROGAR a brilliant success with lot of knowledge sharing. INTERROGAR witnessed active participation from all the sections (1st year MBA) of Main Campus & Kengeri campus. The prelims of the same took place on 24th February 2014, 3:00 pm wherein out of 22 participant teams 4 teams were selected from main campus & 3 from Kengeri. The prelims round tested the knowledge of participantson general events, business, sports, social developments,branding, etc. The teams’ responses were reviewed by the faculty coordinators’ Prof. Binu P Paul in the main campus and Prof. Rahul Gupta in the Kengeri Campus). The seven teams went through an exciting final event on 25th February. The event presented a great learning opportunity for the students of CUIM with some intense quizzing & brainstorming in all the 5 rounds in the finals. Quest members Mr. Vishnu Santhosh & Mr. Debendu Ghosh were quizmasters for the finals. The questions required the quizzers to identify, think and connect the clues. After the third round two teams were eliminated. Thefinal round (5th) BIDDING: participants had to bid cores to answer the questions, which interestingly saw lot of scores going up & down. Throughout the event, quizmasters had special audience questions & gave away lot of prizes to the audiences. And the event was called to an end at 5 pm. The winners Mr. Jithin Joseph & Mr. Ananthram N S of Section I won the first prize with a cash voucher worth Rs 4000 & Mr. N Narayana Krishna & Mr. Pratik Kumar Panigrahi Section L won the runners up with a cash voucher of Rs 3000. The other finalists were awarded with participation certificates. Prof. Ghadially Zoher, Associate Dean, CUIM and Prof. Rahul Gupta, faculty coordinator of quiz club in Kengeri campus gave away the prizes to the winners.